Meet Paul. 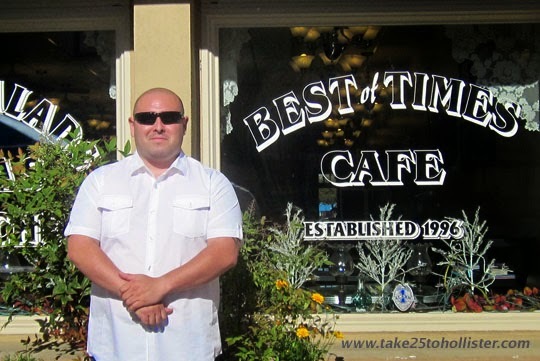 He's one of the new owners of The Best of Times Cafe. Yesterday, he and his partners, Dave and Rachael, officially took it over from Terry. I met Paul at their booth at last week's Farmer's Market. He's been in the restaurant business for a long time and is very excited about this new venture. He says that the restaurant will maintain the same menu and gradually introduce new items that may interest customers. For instance, Paul says they'd like to add steak to the menu and also try out gluten-free items. Buona fortuna, Paul, Dave, and Rachael! And, best wishes to you, Terry! Thank you for establishing the Best of Times Cafe. After all these years, I finally went to the annual Saddle Horse Show & Rodeo. It was lots of fun. So many amazing riders and horses. Watching the kids gallop on their horses at lickety-split speed got me wanting to learn to ride a horse now. 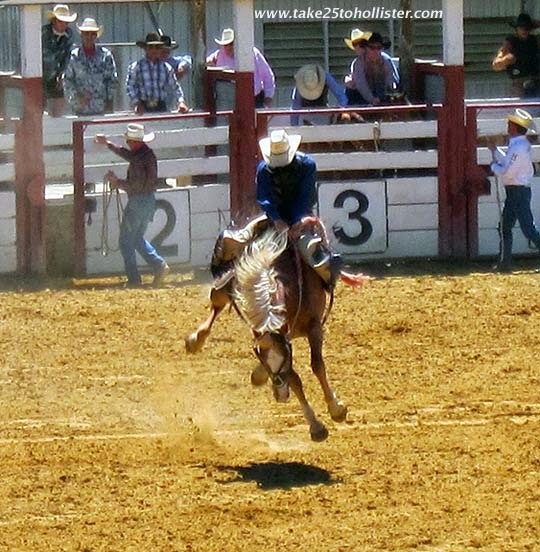 If you'd like to see more of my photos of the rodeo, click here. The link will take you to my SBC Saddle Horse Show & Rodeo album on Facebook. Want to know more about the horse show and rodeo? Check out its official website. 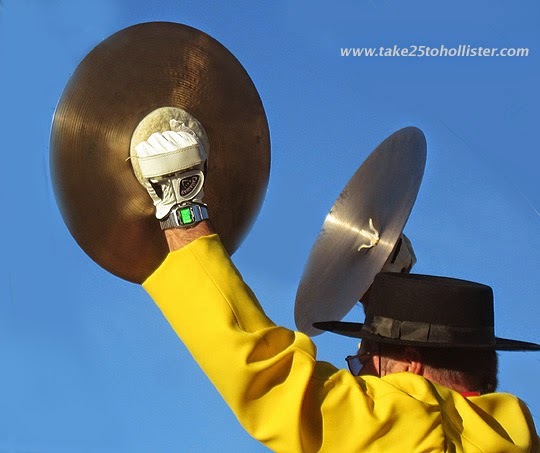 A Watsonville Band member provided the end of a song with resounding joy at Thursday night's San Benito County Saddle Horse Show & Rodeo Parade. 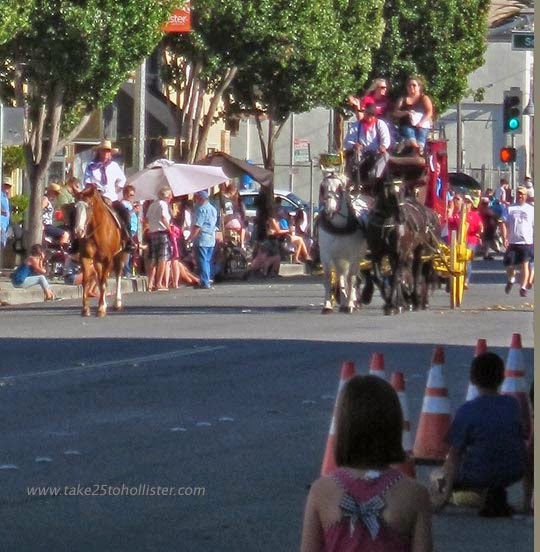 I had the best seat ever to watch the parade that opened the 2014 San Benito County Saddle Horse and Rodeo. This old lady is just not used to sitting on the curb. Next time, I'll remember to bring my beach chair, which, now that I think about it, was in my car trunk. Oh well. If you didn't have a chance to get down to the parade or want to re-live it, I have an album of photos at Facebook that you're welcome to view. Please click here. 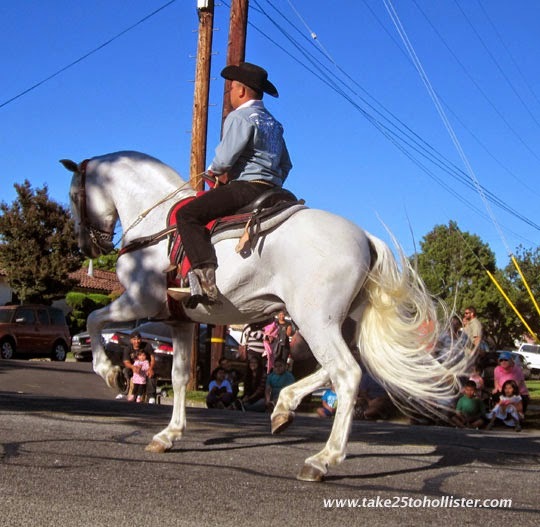 Tomorrow evening (Thursday, June 26, 2014) at around 6:15 PM, the 81st San Benito County Saddle Horse Show and Rodeo begins with its annual parade down San Benito Street. For details about the three-day event (Friday through Sunday), head over to the San Benito County Saddle Horse Show and Rodeo website. 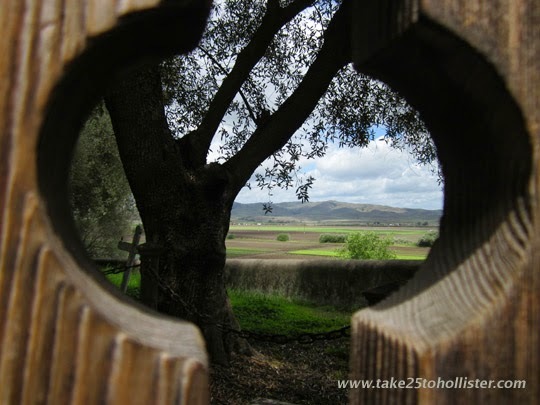 The Husband and I finally checked out the nature area of the Hollister Hills State Vehicular Recreation Area. It's one of two places in the park where you can hike or ride mountain bikes without running into dirt bikes, all-terrain vehicles, and other off-road vehicles on the trail. The nature area is a beautiful place. As we walked on the first bridge over Bird Creek, we thought how even more gorgeous the area must look in the Spring after a rain. A few feet from the bridge, we were greeted by quails, which rushed terrified into the bushes by us, humans. The trails aren't marked so we guessed where we were from the map. Reminder for next time: The area is not as big as it looks on the map. I say that because we came to the end of the trail, which had merged into a dirt road, sooner than we expected. But, then, the Husband thinks that was not the end of the trail shown on the map. Confused? Yeah, us, too. 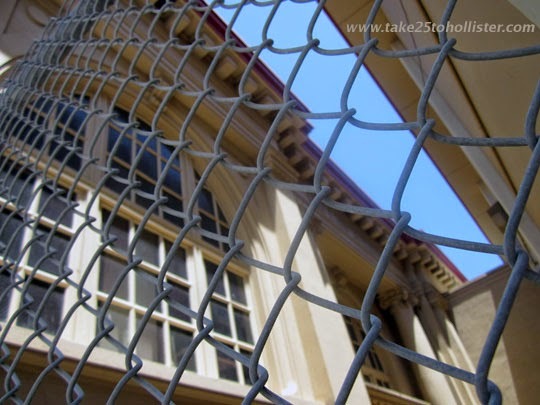 Being law-abiding citizens, the Husband and I turned back. I discovered later that the San Andreas Fault runs through the park. The Husband found out that we had not completely reached the farthest edge of the nature area. As we were backtracking, we took what looked like a trail going up the hillside. A bit of zig and zag brought us up to another jeep road and to a sign that pointed us to locations that we thought we'd already been. Ha! 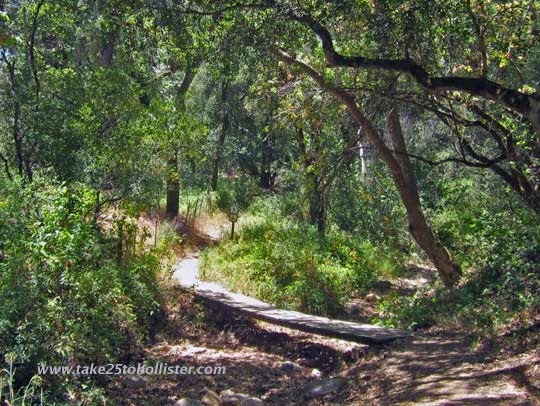 All in all, we enjoyed our meandering about in the Hollister Hills SRVA nature area. It just made me wish again there were more accessible hiking trails in Cienega Valley and other parts of San Benito County. Yesterday, the Old Mission San Juan Bautista Fiesta began with a procession from the church to the historic olive grounds next to the mission. This year, it was lead by the the Grupo Nauhcampa, a conchero dance group from Gilroy. 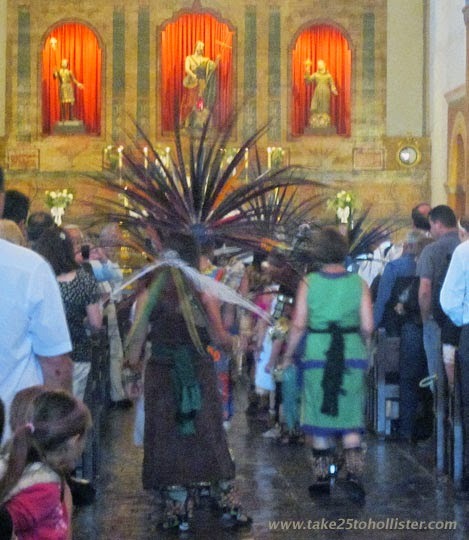 At the end of the mass, the dancers lined the center aisle and, dancing backwards, moved their way down the aisle and out the church. They danced to the statue of St. John the Baptist in front of the church where they performed a ceremonial blessing to the four directions. 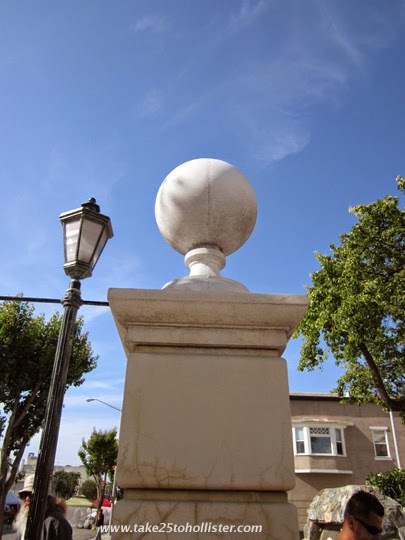 From there, the dancers, Father Jim, and some parishioners weaved their way around the plaza and down to Third Street and through part of San Juan Bautista and up to the olive grounds. 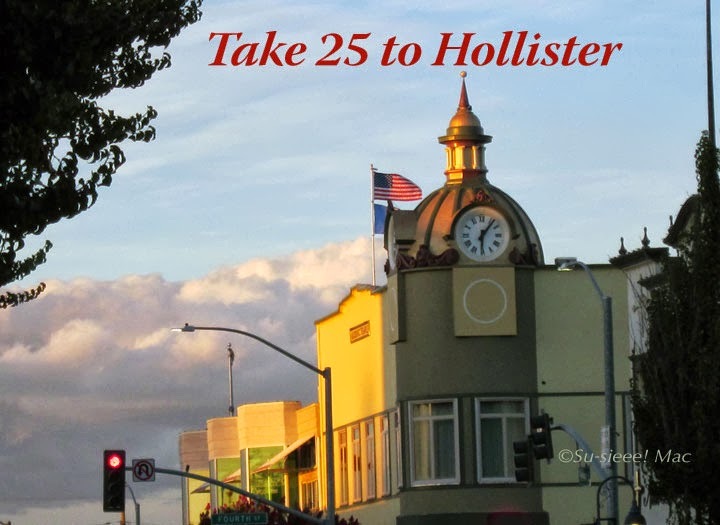 To see photos of the procession and the fiesta, head over to this Take 25 to Hollister album on Facebook. The statue of John the Baptist was created by Sculptor Thomas Marsh. 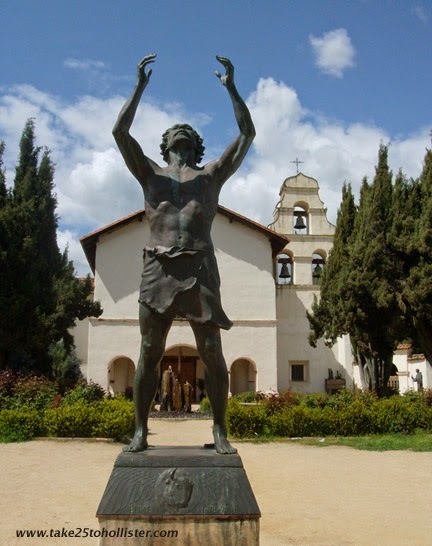 Today, the Mission San Juan Bautista congregation is having its annual celebration to honor St. John the Baptist, the patron saint of the old mission, and its 202nd anniversary. The fiesta runs from 11 AM to 5 PM. Admission is free to everyone. The celebration begins with a procession led by the Grupo Nauhcampa at 11 AM to the historic olive grove, on the north side of the Mission, where the fiesta is held. They lead another procession at 1 PM. Live entertainment is provided by the Mariachi Juvenil Alma de Mexico and the Nu-Horizon Band. The traditional chicken barbecue lunch plate, with sides of chili beans, salad and French bread, is available for purchase at $8/plate. For further details, check out the article by Ernest Franco in the Out and About Magazine. 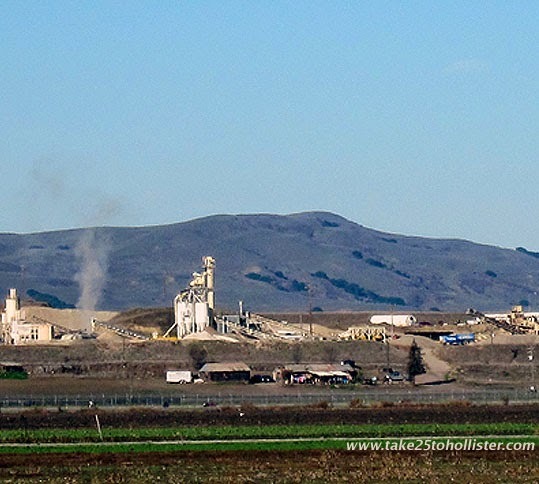 Whenever the Husband and I drove north on San Felipe Road, past the Hollister Airport, we looked to the west and wondered what the tall structures are in the distance alongside the hill. 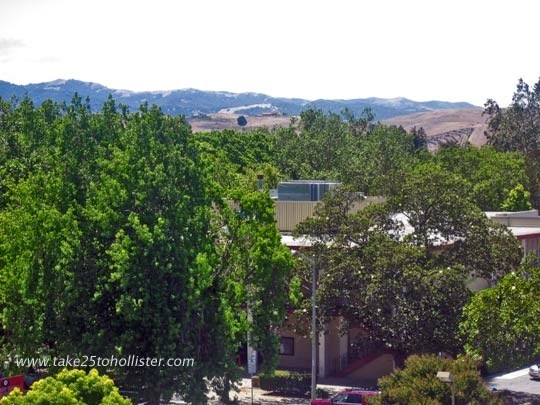 All we knew was that big trucks enter and exit a dirt road off of Bolsa Road on the other side of that hill. I recently learned that it's a quarry over there and it was established in 1999. So much for imagining it was an archaeological dig or a small city of Oz being built. The Don Chapin Company, an engineering construction company, owns Quarry–Plant 25, which makes ready-made concrete, precast concrete, and other products for different types and sizes of residential and commercial construction projects. This scene always makes me think of driving south on 101 passing by a certain exit for Hollywood. Just as long as I pretend the mountains aren't there. Thank goodness we don't have to deal with any kind of freeway traffic or big city jams. 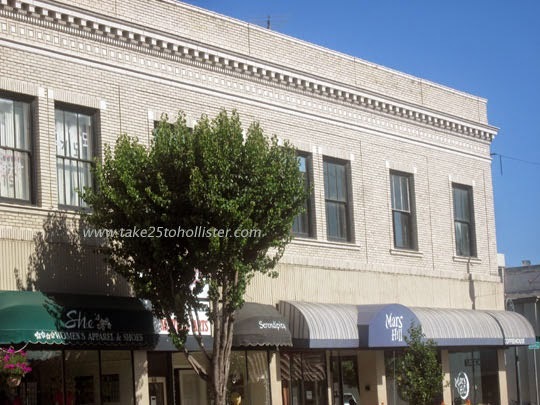 Check out the beautiful detail work of the Grangers Union Building, which takes up half the block on San Benito Street. It was built in 1917. Today, the building is home to Mars Hill Coffeehouse, She's, and West Coast Music and Dance FX, among others. More specifically, Elvis was in the hanger. Elvis did portray a pilot in a few of his movies so he was quite comfortable singing in one of the hangers at the Hollister Airport. Ah, but that was Donald Elvis and his Hound Dogs performing at the Hollister Airshow on Saturday afternoon. Pretty durn good they were. 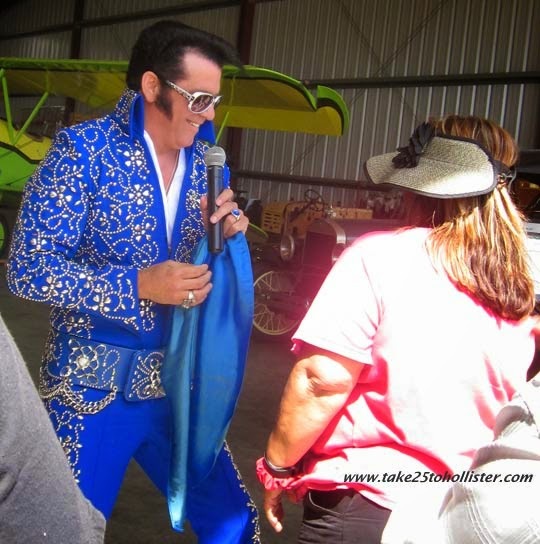 And, like the original singer, Donald Elvis was charming the ladies with his voice, looks, and shaking pelvis. "Is the plane called that because of how you feel after awhile?" I asked Kimberly Walsh, an aircraft mechanic, who spoke to us about the Stearman P-51 Mustang at this weekend's Hollister Airshow. She laughed, then told me that the airplane once belonged to David Gilmour, guitarist of Pink Floyd. So, this former World War II fighter trainer was a tribute to Gilmour. The plane was one of four Mustangs that demonstrated its power and beauty in the Parade of the Warbirds at the local air show. The Hollister Airshow was loads of fun. Did you go? What was one of your favorite parts of the sow? The Husband and I went to the Hollister Airshow yesterday. Wowza! It was the first time I've ever sat at the flight line. It's totally a different perspective and far better than pulling off the side of the road and watching an airshow from afar. Along with aerobatic performers, we watched stunt cyclists, skydivers, warbirds, and a 10,000 jet card do their thing. Various planes were also on display. The airshow continues today. Gates open at 9 AM and the airshow begins at 11:15 AM. The tickets are $10 for children 6 through 12 and $15 for 13 years old and older. Parking is $5. 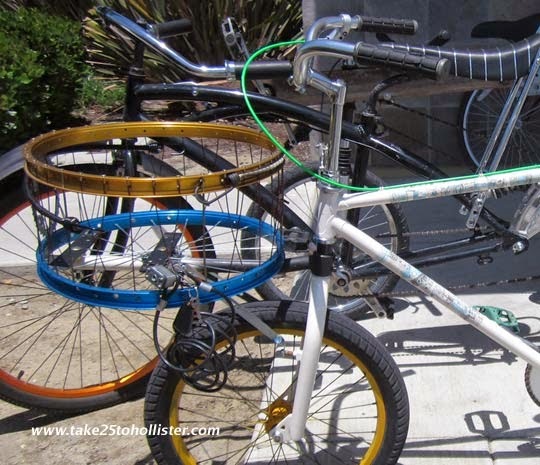 Or, you can take the free shuttle in San Juan Bautista or from several bus stops around Hollister. 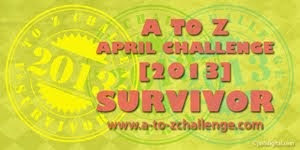 Here's the link for the schedule. Save the Date, Folks: Saturday, October 11, 2014! That's the day of the second annual San Benito Olive Festival, which will be held at the Bolado Park Fairgrounds. 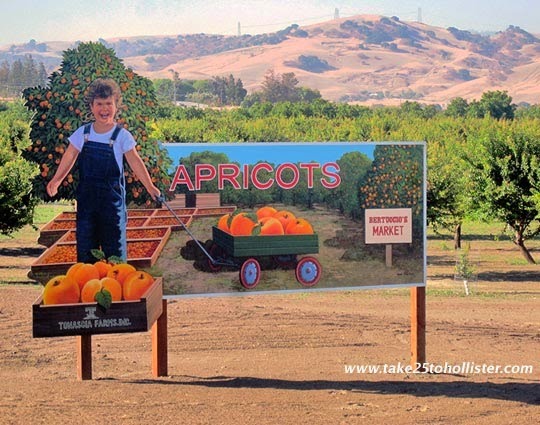 The festival's board members and planners invite food lovers, fans of hometown festivals, and outdoor enthusiasts locally as well as far and wide to celebrate the rich agricultural bounty and rural beauty of San Benito County. 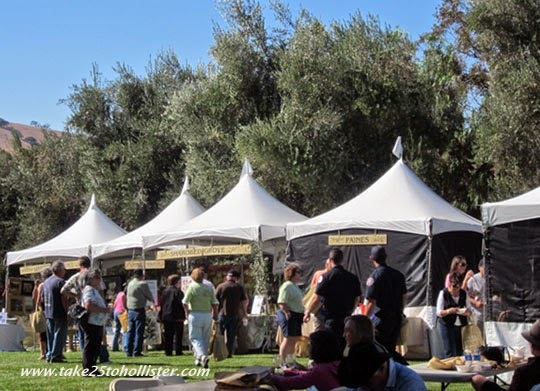 This gourmet celebration will feature many local olive oil producers, wineries, artisanal food makers, restaurants, artists, craftspeople, community groups, and more. Early bird tickets are already on sale online at Eventbrite. Here's the page link for ticket information. 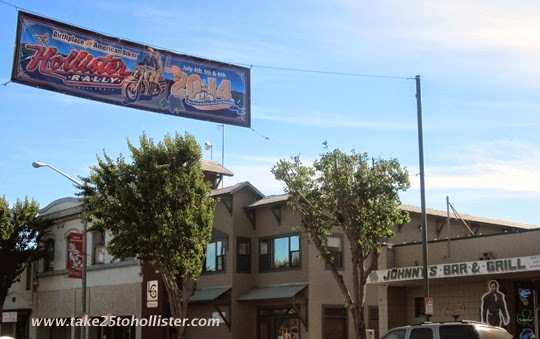 For more information and updates about the San Benito Olive Festival, check out its website and Facebook page. And, if you'd like to see photos of last year's event, check out the photos stream at Facebook. In 1912, the County of San Benito expanded the courthouse at that time by building the gorgeous Hall of Records. It's address was 420 Fifth Street. The building is still there and used, but hidden by the old courthouse, which was built in 1962. While I was in the Elections office recently, I noticed it through the office's break room. Wow, oh wow! 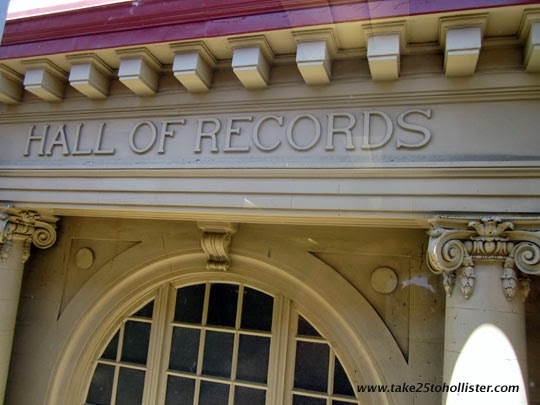 What a shame more people can't see how gorgeous The Hall of Records is. 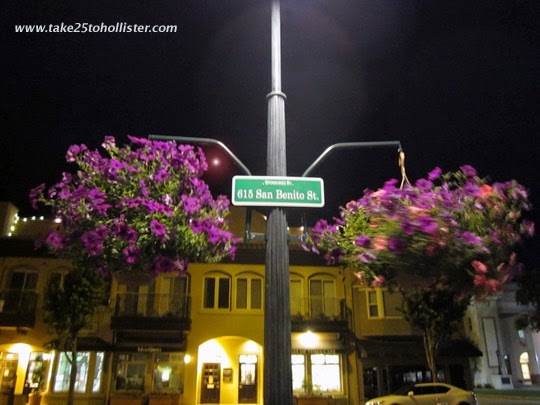 If I imagine the sidewalks full of people, going in and out of the brightly lit shops and restaurants on San Benito Street, I would think I was on Union Street in San Francisco. Seriously. They Might Say. . . If this post and lamp could speak, would they say, "Take me to your leader." Or, "Hey, Dudes! Where's a good place for a beer? Want to join us?" Batman's Gotham City has dark dead-end alleys. Not our town, thank goodness. 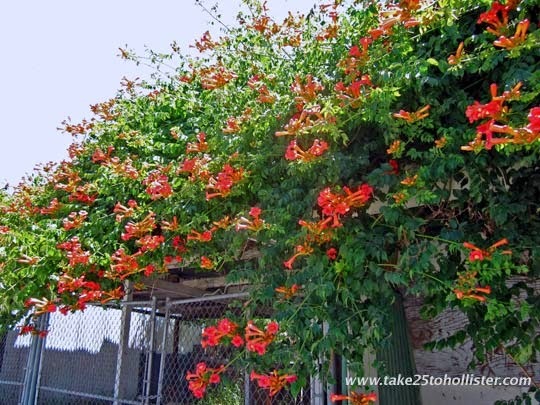 For instance, on Brown Alley, towards the Monterey Street end, you can see this gorgeous blast of color smiling at you. 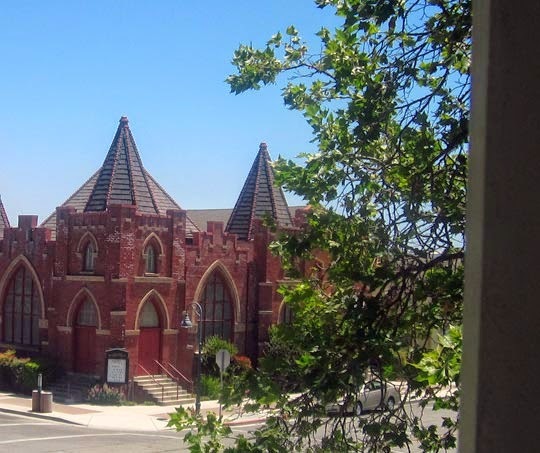 Now, that's an interesting view of the Hollister United Methodist Church from the Old Courthouse. It's almost like the building has eyes. While waiting for the traffic light at Fourth and San Benito Streets to turn green the other day, I noticed movement on top of Briggs Garage. "You can really see those guys standing on the rooftop," I said to the Husband, pointing to two young men looking towards the east. "People probably see us, too, when we're standing in that same spot," he said. "I wonder what craziness they're up to." "The same thing we are when we're up there, to see the view." So, this photo is a view from the Briggs Garage, looking towards the southwest. 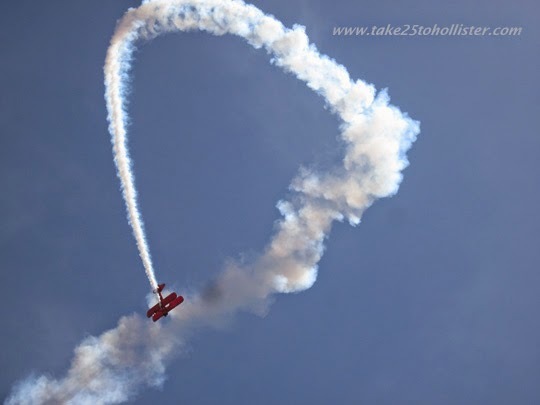 The Hollister Airshow is one of the major annual events in San Benito County. And, it's coming up in eight days on the Flag Day/Father's Day weekend, June 14 and June 15. 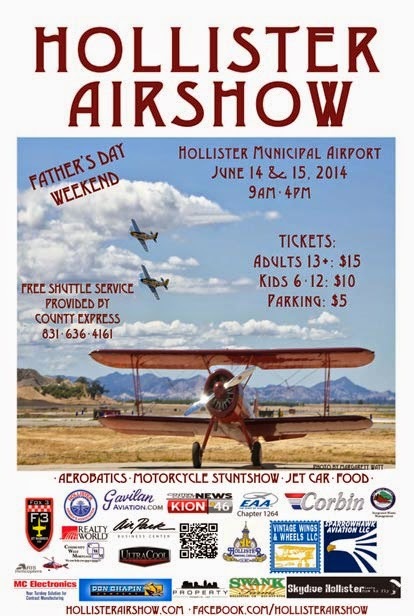 The airshow will be held at the Hollister Municipal Airport. It will start at 11:30 AM, with gates opening at 9 AM, each day. 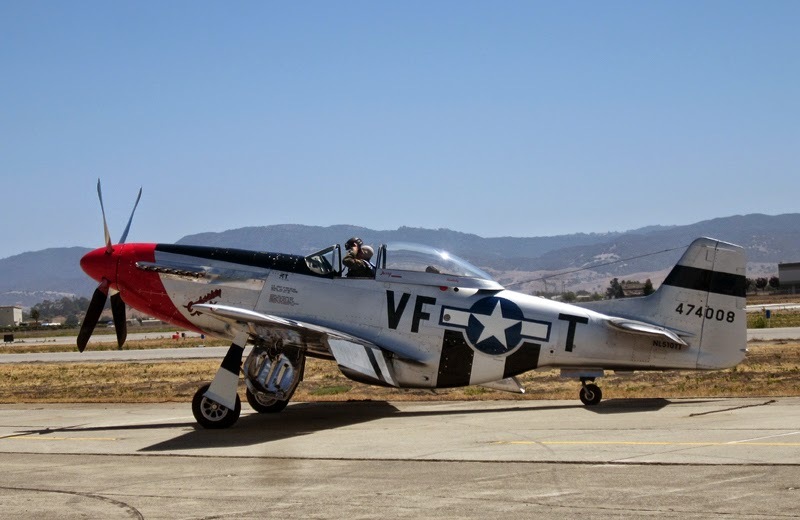 Along with watching aerobatics pilots perform death defying stunts, guests will see pilots do the right stuff in experimental planes, jet warbirds, and other aircraft. In addition, Jason Pullen will execute an amazing motorcycle stunt show and the Air Force Reserve will blow guests mind with an exhibition of its 10,000 horsepower jet car. On Saturday, after the airshow, Donald Elvis and the Hound Dogs will hold a rock-and-roll concert in one of the airport hangars. For more details about the Hollister Airshow performers, check out this link. Tickets will be available at the gate: $15 for adults and teenagers and $10 for children, 6 to 12 years old. You can also purchase tickets before June 14 at the Hollister Airport Manager's office. 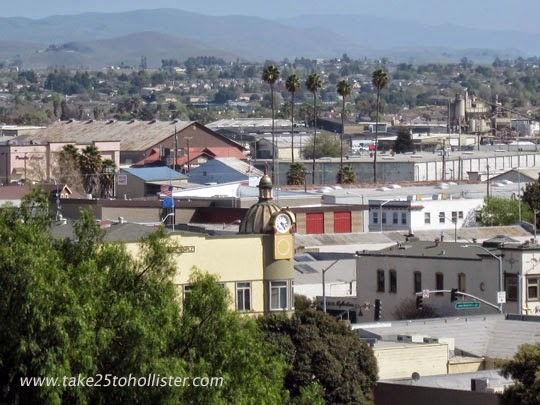 If you purchase tickets online by June 7, midnight, or at the Hollister Farmers Market on Wednesday, June 11, the cost of tickets is $10, regardless of age. This year, the County Express is offering a free shuttle to the Hollister Airshow. Click here for the schedule. If you prefer to drive, parking will be available at $5 per car. For more information about the Hollister Airshow, check out its website and/or Facebook page. 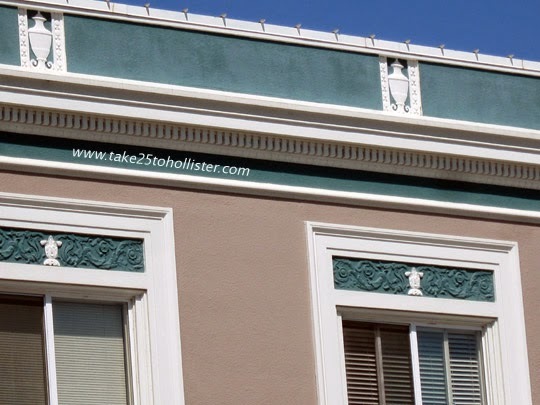 That's all it says on the sign plate of this building in downtown Hollister. 1962. 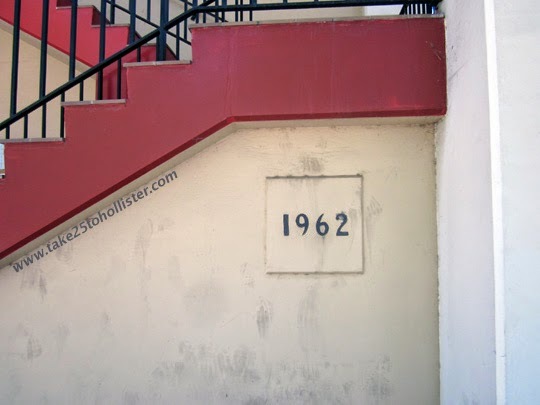 It's not the address, so I take it to mean that was the year the building was completed. Do you recognize it? Even under a layer of soot, I think the simplicity of the sign plate looks rather elegant. Still trying to figure what this building is? Click here. 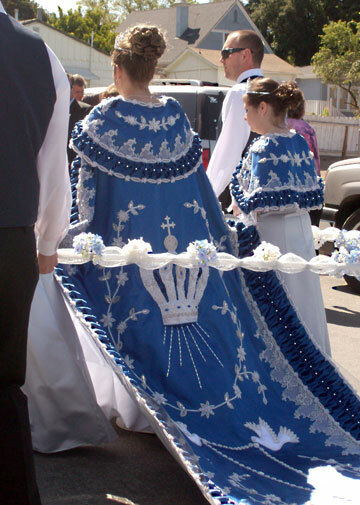 This weekend, June 6 and 7, will be the Festa do Espirito Santo (The Holy Ghost Festival), an event that the Portuguese American community of San Benito County holds every year. This traditional Portuguese festival is celebrated by Portuguese communities throughout the world on Pentecost Sunday. The celebration honors the life of Queen Isabella, the wife of King Denis who ruled Portugal in the late 1200s. At the time, a severe drought caused widespread famine. According to one story, Queen Isabella snuck out food from the palace to feed the people. One day, with her apron full of bread, King Denis stopped her and demanded to see what she was hiding in her apron. She opened it to show red roses, which was considered a miracle because it wasn't the season for roses. From that point, Queen Isabella decided to have masses to maintain the faith of the people through the bad times. On Pentecost Sunday, ships sailed into the Lisbon harbor full of of grain for everyone. The local Festa do Espirito Santo will begin Saturday night, 8:30 PM to 12:30 AM, with a dance and the crowning of Queen Isabella at the SDES Portuguese Hall on 695 Seventh Street. The following morning, the annual parade will start at 10 AM in front of the hall. The parade will go up Seventh St. to San Benito Street, turn at Fifth Street and head down to the Sacred Heart Church. A traditional mass will be held, including the serving of complimentary sopas. After the mass, the festival will continue at the hall. Remember to vote, if you haven't yet. The poll places stay open until 8 PM tonight. 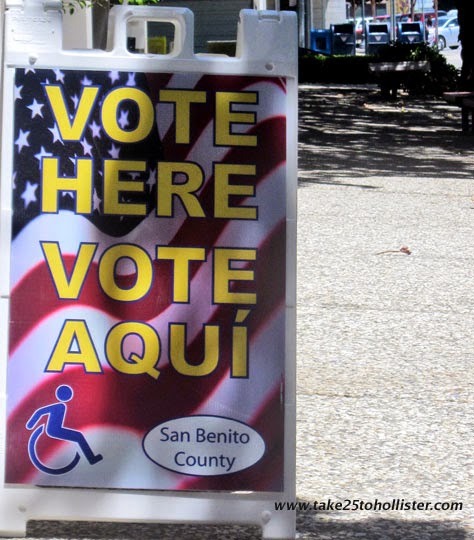 If you're unsure of where your polling station is or need to review the sample ballot, head over to this page of the San Benito County Registrar of Voters web site. 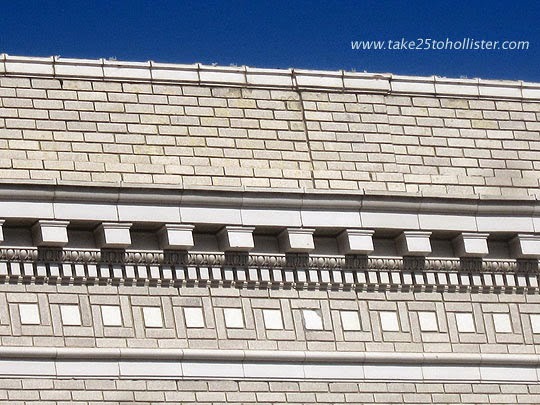 I spy with my little camera eye these decorative elements up high on the building at 728 San Benito Street. They're gorgeous. I wonder why the original owner decided to go with this design. For that matter, I wonder who that first owner was, how old the building is, and what the first shop was in that building. Anyone know?